In his own words, Stephen Gazely tells of his journey in HE, that began with the Step Up to Higher Education programme at Staffordshire University. "In March 2010, I entered a rehabilitation facility to tackle an addiction problem that had begun when I was 14 years old. As my recovery progressed I became determined to replace my addiction with something far more positive, and in January 2011 I began evening classes on a counselling course and attended the Step-Up to H.E. course at Staffordshire University. "In September 2011, I began a Sociology-based course entitled Crime, Deviance and Society (BA) and graduated with a 2:1 (with honours). I then searched for an appropriate Masters course, which reflected my research thoughts and ideas, and in September 2016 began an MSc in Public Health (Addictions) at Liverpool John Moores University. At the same time, I joined New Beginnings, a group of voluntary, former service-users that work with individuals in a detoxification unit based at the Harplands Hospital. 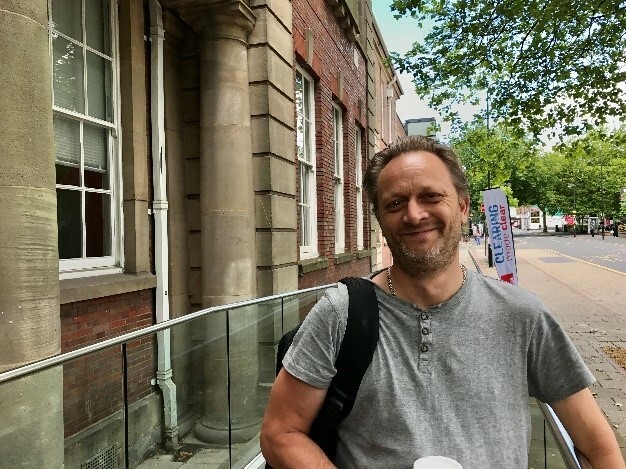 "I now also hold positions on the Service User and Carers Council, the Research and Development Steering Group, and the Directorate for Substance Misuse within the North Staffordshire Combined Healthcare Trust, as well as having an involvement with the City of Culture 2021 bid. I am currently working on my dissertation, which centres around a Social Evaluation of the Importance of Peer Support in Recovery, and have a clear idea of research I wish to undertake at PhD level."